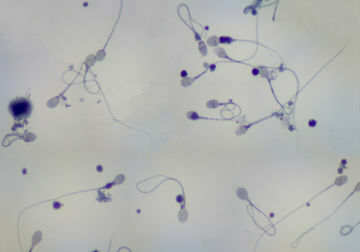 Male-factor infertility happens—and research suggests it's a growing problem. But it's not a hopeless situation. Infertility is a big problem—and while much of the attention around the topic focuses on women, it's certainly not just a woman's problem. In fact, we may be experiencing a “sperm crisis” of sorts. In light of previously conducted research that indicates the average sperm count among men sampled has declined by 50 percent since 1973, the team behind Trak, an at-home tool to measure male fertility, attempted to gain a better idea of what may be behind this trend—and what people can do about it. Dr. Sommer and his team aimed to learn more about why this might be happening—and not surprisingly, they suspect it has to do with lifestyle patterns. “This assessment of over 10,000 men provides a snapshot for how young men are living these days,” he said. “For instance the average respondent in our assessment is in his lower 30s, overweight, stressed, sitting down, not exercising regularly, and not eating well." According to Trak’s findings, 65 percent of respondents work sedentary desk jobs, and the same percentage of respondents consumes fruit and vegetables less than once per day. Similarly, 60 percent of the men report they only work out once or twice a week (or less) for 20 minutes at a stretch. It doesn’t take a rocket scientist to figure out that this isn’t the most optimal way to live…but it is eye-opening to see the effect this is may be having on our reproductive lives. His suggestion? Gain a better understanding of sperm count early on in the TTC process. That way, there’s plenty of time to work at it. And with Trak’s at-home sperm testing and other products on the market, you can do so without heading to a doctor’s appointment. So if you’re struggling to conceive, it’s important to remember that lifestyle factors matter, and that it’s important to consider a male partner’s role in the process. And if you’re looking to gain a clearer picture of your situation, an at-home test like this may be a simple way to gain it.